Canada's oldest Christmas carol was written around 1643 by Fr Jean Brébeuf, a Jesuit missionary. Commonly known as The Huron Carol, the original Huron/Wendat words were translated into English in 1926. 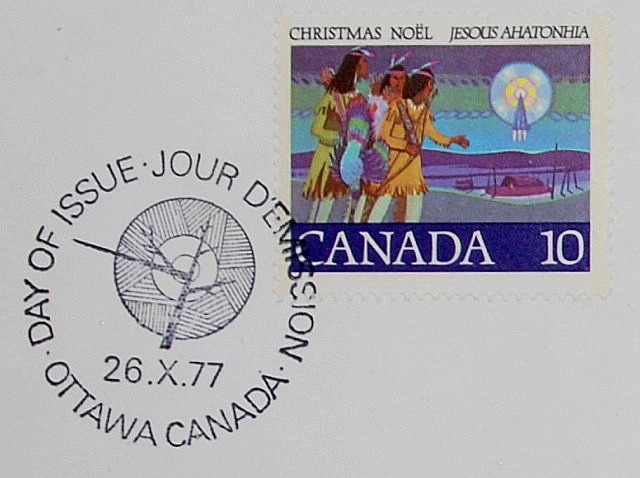 This stamp, based on a painting by Ronald G Wright using native motifs to recreate the nativity story, shows the hunter braves (shepherds) following the star to the lodge (stable). In the carol, the Magi are portrayed as "Chiefs from far" bringing fox and beaver pelts. Gitchi Manitou means Great Spirit. Jesous Ahotonhia means Jesus, he is born. One of many versions for your listening pleasure. Really fascinating stamp and history lesson today - thank you. Beautiful stamp. I always associate the Great Spirit with the Manitou Islands and the tale of Mishe-Mokwa and her cubs. As usual, very informative post about a wonderful stamp.